For the person who has everything and needs to keep it all safe and dry from the elements, our 30 Litre Waterproof Red Dry Tube Bag is the perfect solution. Featuring our easy & trusty Fold Seal System™ and a seamless welded construction, water and dirt don’t even get a chance as this dry bag is 100% waterproof. And if it does end up overboard, you can safely dunk it before it neatly floats to the top. We’ve made this waterproof dry bag of nylon-coated PVC tarpaulin, so it’s super-sturdy and wipes clean easily, meaning you can take it on your active adventures without ruining its good looks. As if all that wasn’t enough, we also added a heavy duty grab handle and adjustable shoulder strap for maximum portability. Apart from protecting your possessions and clothes from the elements, this waterproof dry bag works a treat as a wetsuit bag too, meaning your car won’t smell of wet dog! "Hi everyone! 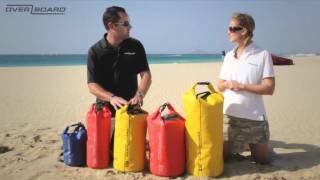 I thought you would like to know that we have taken your back packs and dry tubes around the world with great success! the back packs were fantastic, we had one each as cabin baggage on a six week round the world trip, very comfortable even for the children, and very safe, with the roll up top. also the dry tubes have been out on several boat trips, whale watching in New Zealand, swimming with dolphins in Australia and diving with sharks and rays in Bora Bora! also in kenya on safari the dry tube kept the cameras dust free. best wishes." I can only say thank you... and that doesn't seem enough! My buckle and strap arrived today. Outstanding customer service! You've enabled me to get that old fave of mine out and about again and keep it weathertight. Many thanks once again."